Even kale needs some love. Massaging an acid-based dressing into the fibrous green leaves tenderizes them, making the healthy vegetable more palatable in its raw form. Even kale needs some love. Massaging an acid-based dressing into the fibrous green leaves tenderizes them, making the healthy vegetable more palatable in its raw form. 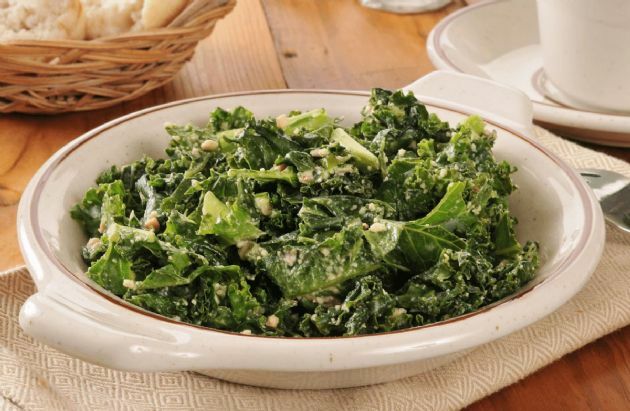 Place the kale in a large mixing bowl. Pour dressing and lemon juice over the greens, then massage the dressing into the kale for 5 minutes. This will help soften the kale. Cover and refrigerate for 4 hours or overnight. Just before serving, add the egg, black pepper, and lemon zest.